Have you ever run out of battery at a crucial time? Make sure you always keep your phone alive in emergency situations with this portable mobile charger. Charging Nokia's, Motorola's, Samsungs, Iphones and more. Will charge near enough every phone. Has different phone adapters. Ideal for holidays, camping, festivals & to just have for emergency. 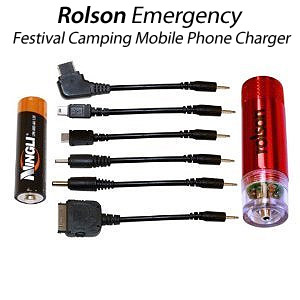 Instead of paying a stupid amount of money for someone to charge your phone at a festival and having to leave it with people who you don't trust, you can now simply charge your phone of this battery operated mobile phone charger.